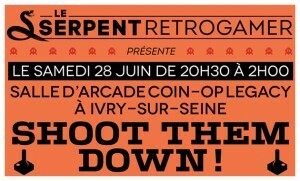 Le Serpent Retrogamer gang/association held, on the last 28th of June, the Shoot Them Down ! 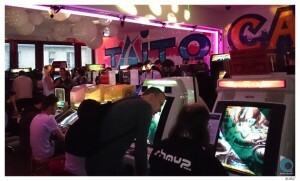 invitational event at Coin-op Legacy gamecenter, gathering sixty privileged people around a shared passion: shmups ! 35 free to play video game arcade cabinets were accessible ; indeed most of them raining down pixel or vectorised bullets on players with classics as Space Invaders, Defender and Star Wars, but Dragon’s Lair 2, Supersprint (2 cabinets) and even a 4 seats Virtua Racing cabinet were playable too ! Only 2 or 3 of them were emulated (much to nostalgic CRT lovers’ delight). 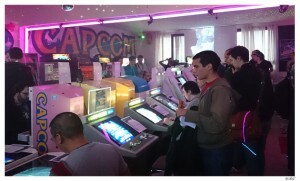 An arcade stick rewarded the player with the highest cumulative 14 scores achieved with 1 credit. I ranked among the humble amateurs and was mesmerized by the bullets’ ballet and hypnotic patterns graciously dodged by talented players. In addition to the nice Serpent Retrogamer team members, celebrities as Damdam superplayer and famous history of game lecturer Florent Gorges honoured us with their presence. A special gift recompensed the brave player being the closest to Damdam’s highscore and she provided us a nice ESP garuda play comment. Florent was kindly chatting and dedicating his books. 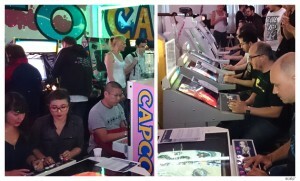 It’s been a real pleasure to be part of this event : we met nice impassioned people, had the opportunity to feel again the authentic (but non smoking) video arcade’s atmosphere, with great lighting effects and perfectly matching music. As icing on the cake: free crackers, dessert buffet, soft drinks, tombola and Retrogame shop selling some interesting items. I can’t wait for attending the next event. A big up and cheerful thank you to Serpent Retrogamer and his partners! !